This is the first of three New Zealand Architecture issues, the others appearing in 1980 and 1982. 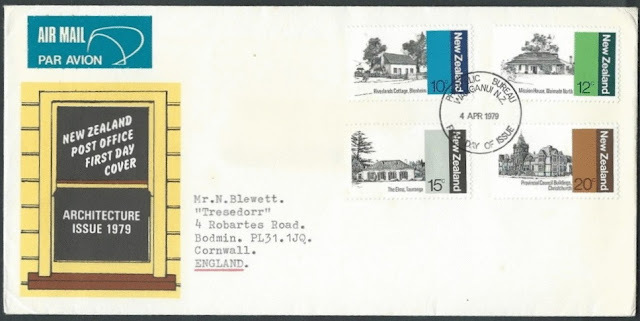 New Zealand Architecture is an interesting subject that has appeared on many stamps. At first most of the buildings were copies from styles found in England but as these styles were adapted for New Zealand conditions, new and distinctly New Zealand styles began to emerge. Buildings from the 1800s were the subject of the first issue on early New Zealand architecture. Notice the purpose of each of these buildings, one a private house, two mission buildings and one Government building. 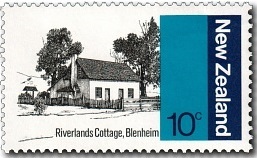 10c - Riverlands Cottage, Blenheim. Built about 1865 for Charles Redwood, son of a pioneering family. Redwood arrived in New Zealand in 1842 and purchased the land in 1865. The present cob cottage could date earlier than this since "squatting" was still a common practice in the 1860s. Lack of suitable timber in Wairau forced the construction of the cob style house. The cob walls were constructed from a mud and tussock mixture while the roof was made from wooden shingles. Administered by the Marlborough Historical Society, interest in the restoration of the cottage from its badly dilapidated state began in 1959. It was opened to the public in 1965. 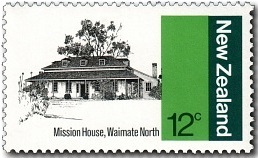 12c - The Mission House, Waimate. The only survivor of three church mission houses built at Waimate in 1831-1832. For nine years it was occupied by George Clarke. Home of Bishop Selwyn from 1842 to 1844, it was later known as the Old Vicarage and much altered in appearance. Restored to its original Regency style by the New Zealand Historic Places Trust, it is furnished as a mission house of the 1830s and is open daily. 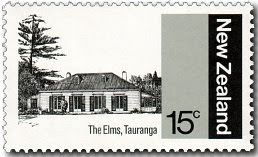 15c - The Elms, Tauranga. Tauranga's historic Anglican Church mission house was completed in 1847 and was the centre of a mission station run by the Rev A N Brown until the middle 1880s. When the late Miss Alice Maxwell came to the Elms in 1887, she set out to preserve the building as a memorial to the mission. It stands today as a result of her guardianship almost unaltered except for the wood shingle roof which has been overlaid with corrugated iron. 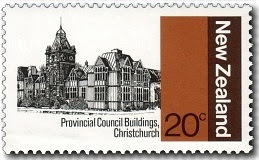 20c - Provincial Council Buildings, Christchurch. Designed by Benjamin Mountfort and his partner Isaac Luck this building dates from 1859 when the first vertically-timbered wooden section was completed. Designed by Mountfort on his own, the Council Chamber demonstrates the use of the cathedral style of Gothic revival for civic or secular purposes. Though simple outside, the chamber has a colourful and lavishly decorated interior with a massive barrel ceiling, elaborately carved stonework, mosaic walls and stained glass windows. this issue. Every example I found was this generic Post Office cover. Another First Day Cover, this time an aerogramme also sent to England.